Excellent for ISO 9000 solder paste mix process condition. Strong mixing / kneading power, enables preparation uniform / high-quality solder paste. Increasing printing quality. LED display panel and microprocessor control, easy to operate. Mixing / kneading solder paste without contact exterior atmosphere. Universal fixture, suitable for all kind of commercial solder paste container. 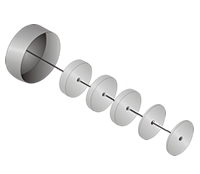 The operation of GAM-60 solder paste mixer is very simple. Loading the original solder paste container into universal holder then press "Start" button. The GAM-60 will mix the solder paste, after your setting time the machine will stop automatically. The well mixed solder paste is ready for printing . Setting the timer by press the increasing and decreasing button. The LED display the setting time. 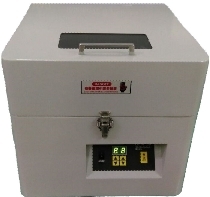 The GAM 60 solder paste mixer provide powerful solder paste mixing capacity. Anyone can prepare the well mixed solder paste to simplify the printing process in STM line. The GAM 60 solder paste mixer equipped with universal solder paste container holders. Which can hold most of commercial solder paste container. The holders are very easy to load and unload the solder paste container. 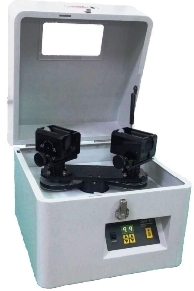 The GAM 60 equipped with electronic time and LED display. It is very easy to operate and the setting range from 6 seconds to 9.9 minutes by 6seconds index.. The GAM 60 solder paste mixer provided lubrication and maintenance free operation.